The ancestral jewel pieces in one’s jewellery collection can be the most personal and expressive accessories with both emotional as well as financial value attached to them. Heritage jewellery includes some precious stones like rubies, emeralds and sapphires, but it’s now time to add some fusion to the age-old jewels. Add some diamonds and other precious stones and this exquisite setting of the past and the present would ace your jewel game and look superb with any outfit. You can also revive up your old jewellery by adding some colored gemstones to it. You can try some rich bold colours that will match the needs of almost all occasions or can even add their zodiac stones with a belief that it will bring immense luck and prosperity to you. While Rubies stand for love and passion, blue sapphires are referred to as the sign of promise, honesty, and loyalty. Sometimes vintage jewellery may not be in the accurate shape and style as per your desire. Don’t throw it away! Visit a creative jewellery designer and get it custom made in any metal of your choice be it gold or silver, with added gemstones to give you a fresh piece. An easy way to enhance the old jewel’s charm is to get it professionally cleaned and inspected. The seasoned professionals will not just clean and clear all the buffs from the pieces handed over to them but will also revamp the setting of the precious gems if required. 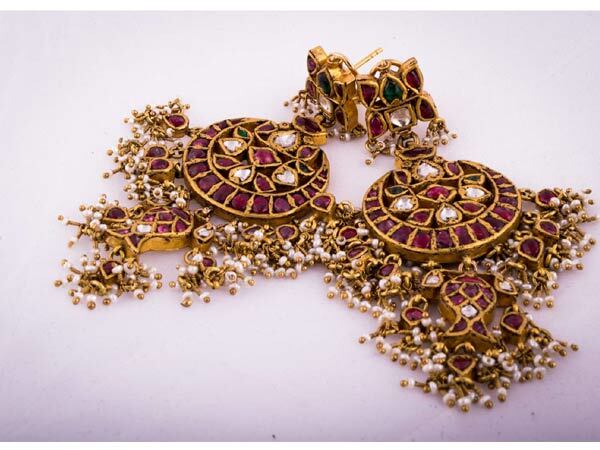 “If the vintage pieces in one’s closet have some precious gemstones but is not accurate for a ring setting, then the jewellery designers can add some elements like metals, diamonds, and more to transform it into beautiful earrings or pendants,” said Kunwar Sahib Singh, Director & Creative Head Motiwala & Sons. So all the women out there, go reinvent the flashback jewels.